Last Tuesday I woke up, made coffee, and sat on my couch scrolling through Google alerts about national monuments. One article I pulled up mentioned that public meetings were being held for the management plan of the new Grand Staircase-Escalante monument. I looked at my calendar. The first meeting was Wednesday, the very next day. I felt a rush of adrenaline that had nothing to do with caffeine: I had to be there. I am passionate about national monuments. For the past year I have been visiting, researching, and writing about the monuments that Trump slated for review. Grand Staircase is one of the more controversial monuments, and one that the president has reduced in size by almost half. So I spent an afternoon tossing camping gear into the back of my car and at 4 in the morning I started on the 8 hour drive to Kanab, Utah. Finally, there was an area where you could submit a written comment or give a verbal comment to a court reporter. “Can anyone nominate those?” I asked. The most important point I learned from the meeting was this: all the land excluded from the monument remains under the management of the BLM, so it does not become private land, which seems to be what many people fear. However, the protections of that land are different than if it were still in the monument. National monument proclamations list specific “objects to be protected,” which can be anything from scenic vistas to endangered species to historic sites to unique rock formations. The management of national monuments is developed with the protection of those specific objects in mind. Standard BLM land manages for multiple uses: recreation, resource development, and conservation. But that land will not be managed with the protection of specific things in mind. 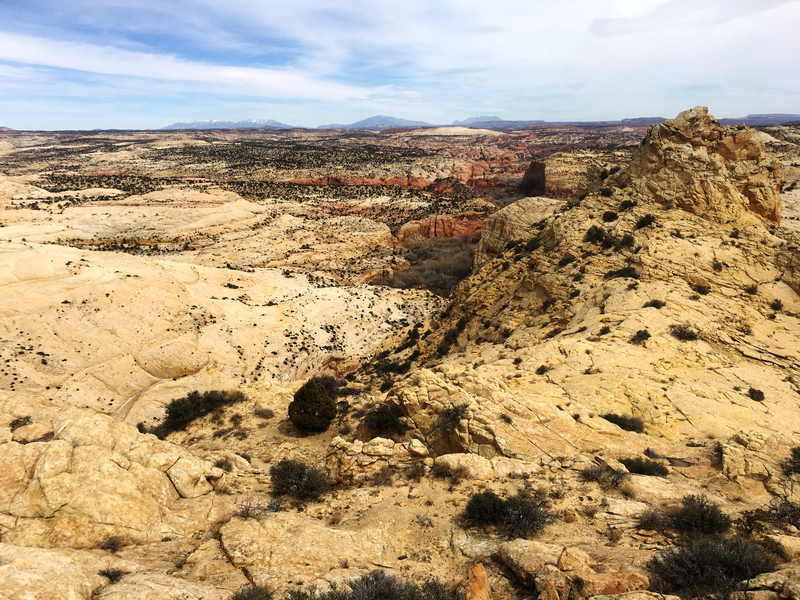 Here is a small example: the original Grand Staircase-Escalante proclamation listed biological soil crust, also known as cryptobiotic soil, as an object to be protected. This soil is composed of a community of living organisms: lichens, mosses, fungi, algae, and bacteria. It benefits the landscape by preventing erosion, discouraging the growth of invasive plants, and storing water for the plants that do grow nearby. Grand Staircase-Escalante is managed so that it educates visitors on these facts and instructs people not to trample the crust. Trails, roads, camping, and other access points to the land within the monument are managed with the protection of this crust in mind. Without the monument protection, new areas of development or off-road access could be put into place without concern for the life and preservation of these crusts. Obviously, there is a lot more at stake here than soil crusts. First, a caveat: writing a good comment takes work. You will need to spend some time researching maps and thinking through your ideas. Unfortunately it is not so simple as letting a policy expert prepare well-researched text so that others can sign their name to it. An effective comment will require more time. However, in today’s political climate I am often searching for what small actions I can take to make a difference. This is one small thing, and it is something that I care about, so it is worth the time investment. I hope that you feel the same. Form letters tend to get lumped into one single comment. The public comment process is not the same as voting. Filling out and submitting a form letter rarely makes a difference. It does not matter how many people submit a form letter expressing opposition or support, those letters will all get lumped into one comment to be considered. A single well-reasoned and well-supported comment makes vastly more difference than thousands of form letters. Comments must be substantive. The more specific the better. As an example, if you were concerned about mining taking place in a certain region, you should mention that specific area in your comment and list other resources in that area, either biological, scenic, or cultural, and explain why you think those resources should be protected. Next week comments are due for both of the recently adjusted monuments in Utah, Bear Ears and Grand Staircase-Escalante. I have compiled a little bit of information about each of these monuments and included links for you to find more information to help inform your own comments. It is my hope that many people will take the time to put together thoughtful comments that will represent the views of the public. This is our chance to have a say in what happens to our land. President Trump’s December 4th executive order reduced the boundary of Bears Ears National Monument by 1,150, 860 acres. He altered the boundary to become two smaller monument units: the Indian Creek Unit, which includes the climbing area Indian Creek, and the Shaas Jaa Unit, which includes Comb Ridge. Direct your comment about land use to the areas in the two new smaller units, even if you are opposed to Trump’s reduction. This planning effort is not making decisions about Wilderness Study Areas (WSAs). Existing WSAs will continue to be managed as Wilderness until Congress decides to either release this land or officially designate it as Wilderness. Climbing was not included in the new proclamation modifying the monument, even though it was included in Obama’s original proclamation. This means the climbing experience is no longer an official object to be protected. If continued access to climbing is important to you, this needs to be mentioned in a comment. The new management plan is considering changes in motorized vehicle access. Are there places where motorized vehicles should be prohibited? Places that should be opened for more access? Mention this if this issue is important to you. A helpful comment will identify where and how recreation should be managed in the two monument units, possibly nominating certain areas as SRMAs or RMZs. For more detailed maps and information about the issues surrounding the new Bears Ears Monuments, see the BLM planning site. President Trump’s December 4th executive order reduced the boundary of Grand Staircase-Escalante National Monument by 45%. He has redrawn the boundary to become three smaller monuments: the Grand Staircase Unit in the west, the Kaiparowits Plateau in the center, and the Escalante Canyons Unit in the east. Here is a map showing the original boundary (black outline) and the three smaller units (in tan). Since this monument was originally designated in 1996 and has been operating under a management plan since 2000, this planning process is creating new plans for not only each of the three monument units, but also for all the land that once was in the monument and is no longer included in the boundary. Comments for this management plan can pertain to areas within or without the new boundaries. A helpful comment would be to recommend Areas of Critical Environmental Concern (ACECs), which can be recommended based on scenic value as well as scientific value. Here is a document offering guidelines for making this type of recommendation. ACECs can be nominated for areas within the new monument boundaries or for areas that used to be in the monument but no longer will receive the protection of monument status. This could help protect some of these now vulnerable areas from mining and development. When nominating an ACEC, make sure to explain what resources you want to protect and why. Be specific. 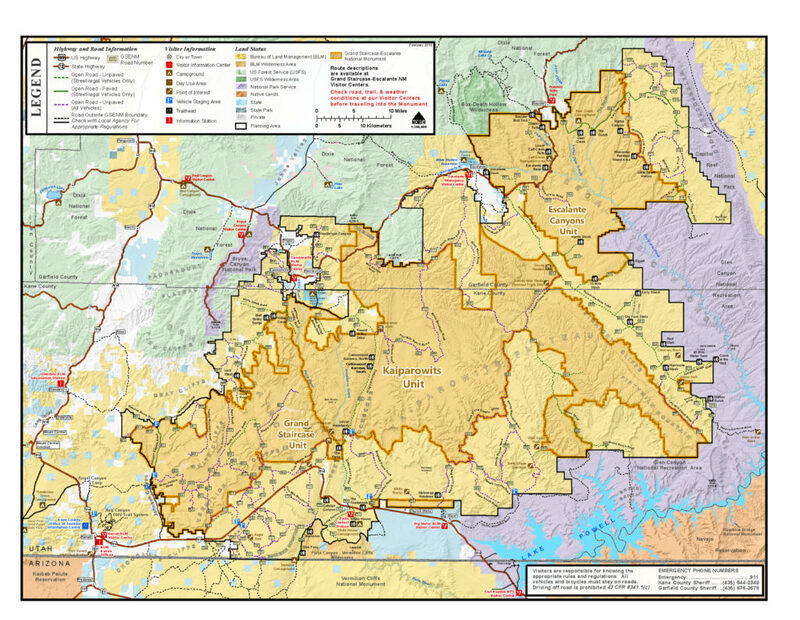 For more detailed maps and information about the Grand Staircase area, see the BLM planning site.